East Coast Elite’s mission is to provide all its members with the finest musical educational experience available. Although sometimes competitive in nature, the activity primarily is a learning experience. Emphasis is placed on self motivation, developing life skills including discipline, fitness and teamwork. It is an education designed to give members an opportunity to inspire them to be the best they can be. East Coast Elite is one of the UK’s top marching corps and are members of the British Youth Marching Band Association, Drum Corps United Kingdom & the Federation of British Youth Marching Bands and is in simple terms a marching performance ensemble. There is the option of joining the Brass, Guard (dance) ,Battery or Tuned Percussion sections. For further information please look at our website or check our Facebook page. Grimsby Bach Choir is a friendly chamber choir, performing a wide range of music to high standards. The Choir is keen to work with future generations of musicians, and frequently works with local young musicians, as well as using up-and-coming musicians as soloists and within orchestras, often current students of the country’s top music colleges or conservatoires. Find out all about us on our website, and find out even more about us on our Facebook page, and at our Twitter feed. Grimsby Jazz Projects is a non-profit making organisation promoting high quality jazz and music projects. Grimsby Jazz Projects enables educational projects to take place to celebrate and develop the jazz genre. We seek to develop knowledge, understanding and interest in jazz, developing the talent and potential of young musicians through workshops that expose them to high quality music and musicians. We also wish to increase the musical appreciation of children whatever background. We deliver cross art form workshops to generate greater interest for younger listeners. We aim to provide workshops for teachers and students, to develop their knowledge and skills; supporting workforce development, which supports the National Curriculum. Humber Taiko exists to support the development of Taiko drumming across the Humber region. Taiko is Japanese ensemble drumming, incorporating catchy rhythms and dynamic choreography. Humber Taiko delivers a number of performances and projects at festivals, events and schools. We work in partnership with local music hubs and local authorities to provide drumming ensemble groups such as Tetsu Taiko in Scunthorpe and Gyoko Taiko in Grimsby. To find out more about our work or to book a performance or project please visit our website at www.humbertaiko.org, contact us for further details via email info@humbertaiko.org or phone 07742 980106. You can also find us on Facebook and Twitter. Music Lincs was established in July 1997 as an innovative, independent music teaching co-operative to provide instrumental music services to schools and the wider community. Our members are experienced, qualified teachers and musicians (also accredited by NELMH) offering specialist tuition to individuals, groups and whole classes on a wide range of instruments, plus demonstrations, tasters, workshops, direction of groups and ensembles. Music Lincs provides bespoke invoicing, administration and marketing services for schools, teachers, parents and students through a central point of contact. Our direct invoicing system relieves schools of administration time and costs, supporting the development of provision and allowing easier access to instrumental tuition for all students. As an independent organisation, as a Delivery Partner, and through our affiliation with local youth music providers, Music Lincs is committed to provide high quality specialist music tuition, to develop performance opportunities, encourage wider involvement, and to celebrate excellence and achievement through music. 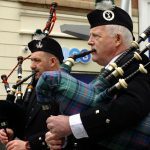 The North East Lincolnshire Pipe Band (formerly Grimsby Atholl Pipe Band) has been established in the area for nearly 50 years giving people the chance to learn and play the Bag Pipes and drums. The group perform regularly across the region at events which include People’s Park, The Beachcomber, The Cleethorpes Carnival and local folk festivals. The Pipe Band has also won several trophies at competitions across the country and are available for bookings at weddings, festivals and events. Bringing unique art and heritage experiences to public places and unusual spaces. We aim to deliver excellent visual art exhibitions, events, festivals and workshops for everyone, through exciting partnerships with local, national and international artists, organisations and venues. We particularly love working with families, children and young people through a range of developed workshops.